Why you ask? Because it’s so damn powerful and extremely easy to setup. The reporting is great and if you did nothing more than simply set it up and install it, you’d have more than enough information to use. And boy is it useful. Want to know how many calls your Adwords campaign produced? Now you will! Armed with that information, you can calculate your costs per lead, prospect and client. If you know what each client earns you, you can even calculate your ROI. What does it do? When your customers visit your site, they’ll be presented with a phone number that will dynamically mask your main phone number. The number changes depending on how they found you. Your customers will be cookied as well, so should they return to your site within a year, that same number will populate. How does it work? You sign up for CallRail, set up your channels and then install a WordPress plugin that will mask your main number on your site. For the most part it’s that simple. If you’re not on WordPress (you should be), you can install a script that will swap the number. One quick caveat: You should never enter your tracking number into a directory website in place of your main number. Yes there are exceptions, but exercise caution if you don’t know what you’re doing here. We do NAP (Name, Address, Phone) clean ups all the time, and we don’t want to have you hire us for this. You will need to create a tracking number for each advertising channel. In figure 1. you’ll see a basic setup example. As you’ll note, we’re capturing the main channels here. For search, you can lump all the major engines into one bucket called “All Search” for “Paid” and “Organic.” We might suggest that you lump all organic into one bucket, and then break out your paid search campaigns into their own sources. You can certainly create one number each for Google, Yahoo and Bing for paid search and organic if you choose. Figure 2. shows how you can organize your campaigns further. We’re using “All Search” for “Organic” here. This channel fires after all other channels. Consider it a catch-all for all traffic that isn’t coming from paid, organic or direct from your site. As an example, this could be a referral from a directory site. Yelp.com is an example (and of course, if you pay for Yelp, you can assign a tracking number specifically to this channel). If you look closer at Figure 2, you will notice a few additional options. 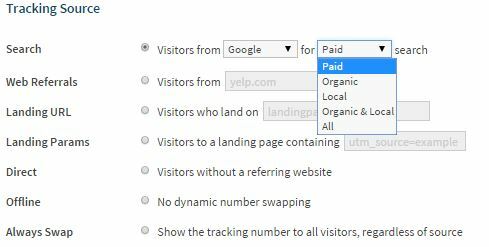 You can track people who land on a specific landing page, or even click on eternal links that contain a UTM code. You can even track “Offline” sources. These would be great for direct mail pieces that prioritize a call as opposed to a site visit. 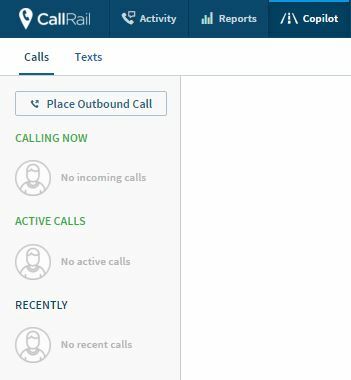 If you just used CallRail for tracking, that would be enough, but why stop there? You can set up Call Flows, which are in essence an “If This Then That” system for routing your calls (Figure 3.) As an example, you could have a caller that dials a specific number between 8 AM and 5 PM routed to one of a few numbers in a round robin fashion. Should there be no answer, you can have that call sent to voicemail, or your cell phone. Calls outside of that time can be routed in a different manner. These numbers even receive text messages if you enable it. Sure you’d have to make sure you can answer these text messages in a timely fashion, but it’s one more way that your potential customers can interact with you (just remember to have them opt-in, if your local laws dictate this. I’ll leave the legal ramifications to you lawyers). You can even dial out from any of your assigned numbers using their CoPilot section. 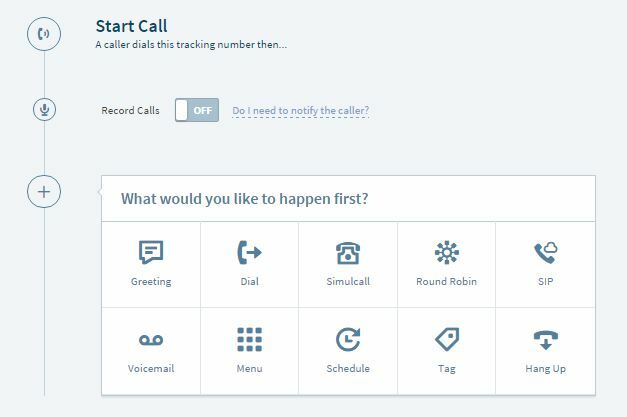 You simply click, “Place Outbound Call” and you’ll tell the system who you’re calling, what number you’re calling with, and what number you’re at. You coulld place a call from this system using your cellphone, and the person you dial would see the business number. Copilot also allows you to see live or recent calls, place calls and answer or send text messages. Form Captures. Yep, if you have contact forms on your site, CallRail can capture that information as well. It includes the typical input fields like name, email address and also includes referrer information (e.g. Yelp.com). Call Recording. This can be hand in a number of ways. You can (and should) enable the Google Analytics integration. This will place the call data in to Analytics for you in the form of events. Heck, you could even track keywords, but that’s a completely different setup, and likely the topic of another post. Keep in mind that CallRail also has FANTASTIC support and a great, up to date knowledge base. So what’s stopping you? Let us know what you think in the comments.